I wrote the following in response to an inquiry questioning whether my stance on having Montana state resources investigate the impact(s), if any, of geoengineering on the people, plants, animals and other resources in our state was additional spending, and thus counter to Libertarian financial conservative principles. I understand your question as well as the underlying question it implies. I will answer both. The state government of Montana lists 36 separate agency websites. As governor I would authorize no additional agencies, nor would I allow budget increases for any existing agencies. Furthermore, I would work to eliminate several of them by transferring their work back to regional or local government or the private sector where appropriate. It is probably more accurate to say, “As many of them as politically possible”. While I have long been a public, overt champion of small and smaller government, I have personally, philosophically evolved into an anarchist. I no longer believe “a little government” to be any more possible than “a little pregnant” is. Many people articulate that “power corrupts”, but overlook how it attracts the corruptible. The greater the power and reach of government, the greater the attraction and the uglier the rulers who sacrifice everything to attain positions of power. However I am pragmatic, and therefore politically a Libertarian activist. That is, I believe the political process to be our only hope of shrinking government without horrible disruption and destruction. Therefore I compromise. I work with possibilities that are achievable within our current social and political structure. For over 20 years various federal agencies and partners have been deploying aerosol nano-particles into our atmosphere purportedly to reflect solar heating away from the Earth, along with other published justifications. While many activists have deplored and agitated against these programs, I have largely ignored them, preferring to work against what I viewed as more clear threats to life, liberty and property. But once I SAW, I could not un-see. As often as not, the skies over my corner of Montana are methodically criss-crossed not by point-to-point cargo and passenger jets with no, or quickly evaporating vapor trails, but by spray planes deploying broad, white trails that spread and merge over the ensuing hours until the whole cloudless sky is milky white stripes instead of clear blue. We occasionally get to see USAF tankers refueling “cargo” planes at similar elevations over our heads with neither leaving any trail at all. What are they spraying, why, and what are the effects? There are many websites theorizing, researching, documenting, debunking and proving that there are nano-particles and negative effects from them. It is all very much a fringe topic. But IF it is true, it is awful. Many people who won’t wade through both sides on the Internet need credible proof one way or another. Montana state government has several existing agencies whose charters include air, soil, water, plant, animal and human health. The capability to test and quantify presence and effects of sprayed particulates not only is already within the power of Montana state government, it is in existing charters of numerous agencies. They merely need a chief executive, that is governor, to make that a priority for them. With a little guidance from the top, they undoubtedly could find other research or activities on their agendas that are of lower priority … or we could find replacement agency heads who would. Is it important or just some whack-jobs ranting? I draw the line at publicly seeking credible proof one way or the other. I refuse to be drawn into conclusions at this stage. However, there are clearly documented proofs of abnormal “available aluminum” (Al+++) in USofA soils in other parts of the nation, and solid evidence of clear detrimental effects on plants in field observations and testing. This ties together with claims (evidence?) of aluminum nano-particles being a common element in “chemtrails”. There are also huge swaths of North American forests recently “inexplicably” dying off. In those areas scientists are finding hundred-times levels of Al+++. 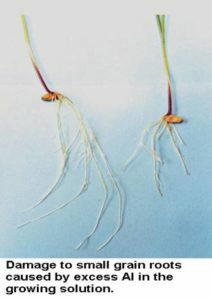 Documented testing shows stunted roots and transpiration as a direct result of elevated Al+++. In Idaho/Montana, pine bark beetles are finishing off weakened trees in cancerous swaths growing in our forests. Foresters are “puzzled” by the trees’ inability to invoke their natural defenses. Could testing for Al+++ in the forest soil and roots find an answer for them? Let’s see. If the alarmists are right, we better get cracking. If not, let’s prove them wrong. It should be quick, inexpensive and easy with a relatively tiny diversion of existing state resources.